Since the earliest organized skating, there has been a dichotomy between Ice and Roller organizations, although various efforts were made to combine both under one umbrella. And in the United States, Roller skating was even split between two organizations for many years (1939 to Fall 1971); the Roller Skating Rink Operators Association (RSROA) and the United States Amateur Roller Skating Association (USARSA). 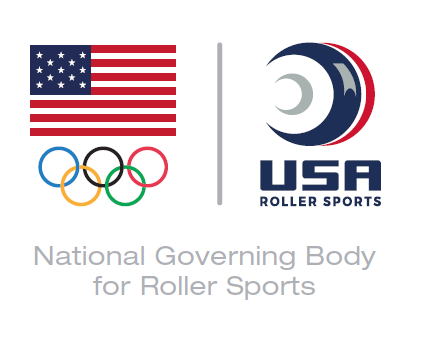 A case could be made that this U.S. roller situation interfered with the growth of the world-wide roller organization with consistent rules, World Skate Figure (previously FIRS - International Federation of Roller Sports) and the adoption of artistic rollerskating as an Olympic sport. Stylistic differences continue in US roller dance between 'American' and 'International' or 'World Class' dance. The 'American' being more controlled, precise and effortless-looking, where the 'International' exhibits a freer, exuberant look with large leg and arm movements. 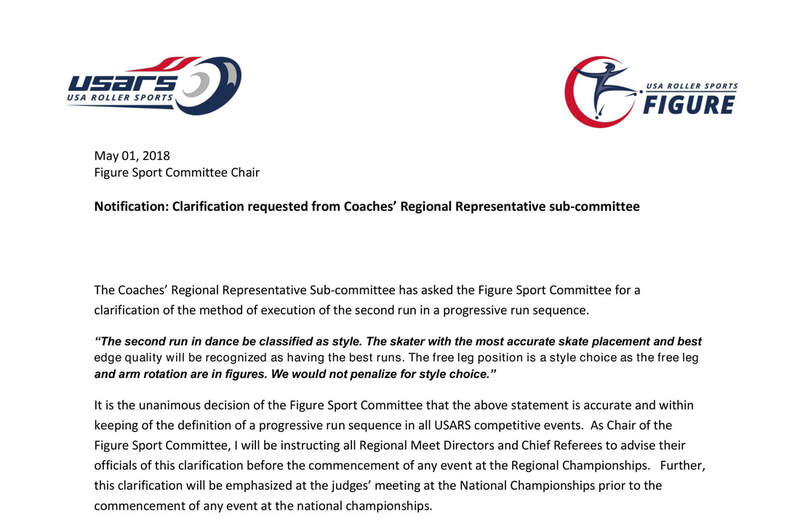 The first official clarification which addresses the 'straight back' progressive run used in the American style roller skating and the 'crossed progressive' used in the International style, declaring they are a matter of choice and 'style', and use of neither will be penalized. Finally all of the sport discipline logos will remain intact with no changes. Noted are different brand standard examples and affiliations using the new logo. This report is our effort to bring back to the US coaches and officials the exciting changes already in place for 2019 starting in the new season of September 1, 2018. This program will eliminate the existing judging system across the world. This will bring the entire world, their skaters, their judges, and their officials together on an even playing field with a fair and unified approach to evaluation of the quality of execution (QOE) expected at every age group of competitor, not just World Class! We learned so much, changing everything we all thought we knew. Now, there are techniques that are more progressive and judging systems in place. This makes all countries equal on the world stage. Our responsibility as your delegates to this convention is to share immediately what we learned. By sharing this information, there can be no misconceptions or misunderstandings about what you may hear, what you may suspect, what you may think, or what you may assume when you attend future workshops. Imagine a fresh start for our sport from tabulation, evaluation, coach and judge training—all is new. THIS IS A NEW START—NOT A SUGGESTION. We now have a new evaluation system – RollArt— which assigns values for each element and the qualities of execution (QOE). This system is designed to be utilized for all skill levels and at all levels of competition, and will initially be used at the 2019 World Championships. We would like to the thank USA Roller Sports for the opportunity to represent the USA and all of you. We spent two travel days, four full days of intensive education in classroom from 9:00 a.m. until 10:00 p.m. or later being educated on the WSF system, now adopted across the world. We were among 30 countries and over 450 attendees discussing, learning, and immersing ourselves in this process. At this conference, they also provided education and testing for over 65 candidates to assume the role of technical specialists in singles and pairs free skating. We now have a better understanding of the rigorous testing and education requirements necessary for our nation to be adequately trained and educated to fill these very important, essential roles at both national and international levels. THIS IS A REALITY—NON-NEGOTIABLE, yet exciting. Even with over two hundred years of combined experience in the sport among the delegates, we were overwhelmed; our eyes were opened! We are excited about the positive direction in which skating is now heading. To paraphrase Sabatino Aracu, President World Sport, from his opening address at this conference, this name change is to reflect a new day, a new direction, and the new branding of roller skating comprised of professionals within 10 disciplines. With skateboarding now an official Olympic event, roller artistic as such must improve. Artistic roller skating must be a showcase for our sport. “Be brave with change” was his motto. #everybodyloveswheels. Concerning the transition from the RSROA and USARSA to USAC/RS (and its successor USARS) in 1971-1972 and the state of artistic skating in 2016. ​source: Bill Spooner on the eve of the 2016 National Championships in July - posted on Facebook site "Saving Artistic Roller Skating"
Our members are very active on Social Media and many seem to have diverse opinions about how USARS [United States of America Roller Sports] got to the position and what are the solutions for the future. Pat Jacques seems to have a good perspective but others attribute the decline to USARS excluding RSROA [Roller Skating Rink Operators Association] The organization that cannot find common ground and educate its membership is destined to decline. So let me offer my historical perspective since I have been involved as long as many of these persons with thoughtful comments and my wife was part of the governance 25 years ago. The RSROA was not excluded except on paper. The Bud Van Roeckel’s, the Nazarro’s, the Well’s, the Castro’s, the Pollards, the Anselmi’s, the Ringheisen’s, etc, etc were in leadership positions and they as leaders learned that the US Congress passed a federal law called the Ted Stevens Sports Act [Sports Act of 1978 and amended 1998, sponsored by Ted Stevens. The 1998 revision greatly widened the definition of 'amateur'] that established the USOC [United States Olympic Committee] after a political disagreement with the AAU [Amateur Athletic Union] and in cooperation with the NCAA [National Collegiate Athletic Association]. The icons from the past established USAC/RS [United States of America Confederation of Amateur Roller Skaters] to work toward the dream of the Olympics. Look at the board makeup. It required athlete participation at 20% of the governance. The Sports act at the time and the limited definition of what was amateur, indicated that a trade organization could not govern a sport. RSROA was and is a trade organization. However, there has always been rink operators on the board of directors and many, many times those operators have been the president or leadership of the RSROA. Those same icons ELECTED Marie Walker as the President and Chairperson of the Board. She was not an operator or a skating teacher. She was an art judge. The RSROA and USAC/RS shared an executive Director but they chose to leave Lincoln, NE and establish their offices in Indianapolis. They felt the goals of USAC/RS did not focus on the development of the business and they were right and protected their organization. Not everything can be attributed to the separation. However, you are correct if the operator has little time for a club then the sport has additional challenges. Let us not forget that in the “good Ole days” the operators created competitive skating to have an additional revenue stream when the rink did not have sessions. The industry has lost 80% of the roller rinks in the nation. The times change, recreation patterns changed and the economy changed. The men and women who built the rinks have passed on and their children and grandchildren run the rinks that remain. They are businesses that have to meet a rink mortgage payment, educate their children, pay for house and clothes, and plan for their retirement. Add in that a large space with real estate is in many areas worth more than the business due to location or structure, some people choose to close facilities to ensure their family goals. It is USARS advantage to have different points of view. In any business to have differing opinions helps avoid costly mistakes. Not always are those opinions heard or operated upon. Other cultures have looked at alternatives for clubs such as sports centers, tennis courts, garages etc. Our culture has not chosen to move in that direction. Other cultures have had limited time and chose to have group instruction and other methods of coaching. Our coaches have chosen to not adopt that method. Several persons have posted suggested the leadership of arrogance and selfishness. It is very difficult to determine arrogance from confidence. In one case you do not produce results and the other there are results. From my position in the history, the icons and those who came after were confident and they did produce results. Culturally, our society currently has a method of problem solving that is more focused on one extreme or another. It is polarized and more a perspective of with me or against me. Compromise and working toward a new perspective and new planning is very difficult in culture at this time. If you do not believe this is accurate, view our own government, our economic crisis’, our education system. You are right that ordinary people cannot drive 80 miles a day to practice. You state that USARS excludes operators from the interests of the sport. Im confused! Mr Fearnow owns a rink, Ms Anderson owned a rink until recently and her son owns a rink. Mr Hansen owns three rinks, Mr Brown owns three rinks, Mr Pollard owns a rink, Mr Hughes owns a rink. The coaches have representation also Mr and Mrs Anderson taught skating until recently, Mr Brown as taught skating, Mr Hansen teaches skating, Ms Hildebrand is one of the most respected speed coaches in the world. Gloria Manning teaches skating, I personally believe that operators and coaches are partners in the governance of the sport. These are people who own multi million dollar facilities. In an era where participation is valued more than competition we have 4 times the events we had when the RSROA governed the organization. We have higher levels of litigation so the operator must and USARS must protect the athlete with higher levels of insurance as is mandated by USOC regulation. Coaches charge more for lessons although in actuality when adjusted for inflation they charge less. Nationals is longer requiring rental of facilities for longer periods at higher rates. Costs to travel are higher. The building that USARS owns is a historical landmark and we own it. However, it cost money to keep it going. We have only 5 staff who work way more hours than 40/week. We need computer systems to make joining easier and more manageable to track. We need so many things and YES we need the thoughtful guidance of our membership to raise issues and potential solutions to the myriad of challenges that the current leadership faces. I appreciate and value all the voices and I look forward to you offering solutions and guidance rather than a sermon on the mount. If you choose to continue to offer the past as a perspective I am happy to listen and read. Writing is not my skill set but I felt I should respond as part of the leadership and give the history as I knew it and encourage people to continue to comment and give solutions. Complaining about the current situation is one method of dealing with frustration but it is more productive to complain and offer solutions from my life experience. source: Tom Bense, May 20, 2016, Facebook 'Dance Roller Skaters' Facebook page. Solo Dance was created to fill a very specific "need". Male partners were always at a premium. There just simply weren't enough to go around. It wasn't a problem that was more pronounced in either the old "A" or the "R". It was universal. So, those in charge understood that from a business sense, you couldn't have a large percentage of your paying customers sitting there without providing them with a means to participate in the part of the sport that they loved the most, namely "Dance". And, if the sport could NOT provide these thousands of girls with a proper male partner, that something had to be done. Something had to be created to allow these girls to skate dance at some level if not the highest level. So, "Solo Dance" was created. It was a "FEMALE" event. You could not afford to tell thousands of paying customers, girls who bought wheels, bearings, boots, plates, skirts, tights, socks, etc, etc. sorry sweetheart, we have nothing for you.. go skate figures. THAT, is not a proper answer. So, "Solo Dance" was created. And it was a very smart move. We never told a female Free Skater that she could not skate singles at a National Championship simply because she didn't have a "Pairs Partner". So, it made perfect sense to provide an avenue for the "FEMALE" dance skater in this sport to have a means to skate dance in at least some level of competition. So it started first at the local contest level and mushroomed very quickly. But make NO mistake. This was ALWAYS intended to be a "FEMALE ONLY" event. It was NOT EVER intended to be an event open to male skaters. It was always felt that a male dance skater who couldn't get a female partner was the extremely rare skater indeed. I have always supported the concept of "Solo Dance". I supported it's inclusion at a National level long before it was incorporated into the Nationals Schedule of events. I believe it to be a brilliant move to solve a very severe problem, the lack of male skaters in the sport. It gave an opportunity for these thousands of girls across the country to participate in our sport in "Dance", an opportunity that they never would have had otherwise. However, the overwhelming goal was still to find a partner and skate dance the proper way, the way dance was always intended to be skated. And then, the rules were changed. And the reason and the intent for the event was lost. And like so many other aspects of the rules of artistic skating, convenience overwhelmed common sense. The solo dance event structure has been expanded far far beyond it's intent. It's now just a series of the same skaters skating the same requirements, with the same winners taking multiple medals doing the same things against the same people over and over again. We have taken an event structure that had 82 total events at a time when we had over 30,000 amateurs in this country, and expanded it into a structure that now has over 220 events for only about 1700 skaters. Someone please convince me that that makes ANY sense whatsoever. We have event after event at Nationals either uncontested or with less skaters than the fingers on one hand. There is NO victory without competition. To be a champion you have to beat someone, and preferably more than one other. ​Although skating was born in Europe, figure skating as we know it today traces its origins directly back to an American - Jackson Haines. Haines was born in New York in 1840 and died in 1875 in Finland after catching pneumonia while traveling by sled from St. Petersburg to Stockholm. Just before the Civil War, a skating craze (accompanied by a dancing craze) swept over America. It was during this time that Haines leapt into the limelight with his mastery of skating and dance. He was a true revolutionary in a country where figure skating had laboriously developed a stiff and rigid style. The free and expressive movements of his performances were condemned by many Americans. In 1863 and 1864, he won the Championships of America (now known as the U.S. Figure Skating Championships), but he continued to receive cool receptions from his countrymen. His lack of popularity in America finally prompted him to go to Europe, where he was an immediate success. He was especially popular in Vienna, where he gave birth to the so-called "international style of figure skating." While Haines gave America its first taste of the international style of figure skating, it was not until the turn of the century that this influence finally began to secure its place in the American figure skating community. This event came about thanks to the efforts of Haines and three other figure skating pioneers: Louis Rubenstein, George H. Browne and Irving Brokaw. Rubenstein, of Montreal, Canada, was one of the first individuals who recognized the merits of the international style and the need for organization in a sport that had largely existed as an informal collection of skating clubs. It was through his efforts that the first attempts to form a national governing body began. In the late 1880s, Rubenstein was the force behind the formation of the Amateur Skating Association of Canada (now known as Skate Canada) as well as the National Amateur Skating Association of the United States and the International Skating Union of America, both of which were forerunners to U.S. Figure Skating. While Rubenstein laid the groundwork for uniform competitions, tests and a future governing body, it was Browne and Brokaw of Cambridge, Mass., who put that work into action by means of the first "International Figure Skating Championships of America," considered to be the first championship of the United States in the new international style. Browne, who had studied with the leading European skaters of the day while in Davos, Switzerland, was a staunch supporter of the international style of figure skating, authoring several books and developing a new type of skate in order to promote this method of skating. Much of the success accomplished by Browne was augmented by Brokaw. Brokaw, who had been influenced by the skating of Haines, collaborated with Browne throughout the early 1900s, demonstrating the international style throughout the country. Brokaw was part of the first formal demonstration of the international style in 1908, and was the first American to participate in international competition, placing sixth at the 1908 Olympic Winter Games in London. In 1914, Browne organized the first International Figure Skating Championships of America under the auspices of the International Skating Union of America (I.S.U. of A. ), the governing body for both speed and figure skating during the early 1900s. The competition was created to promote the international style and attempt to streamline figure skating in the United States. As a result of the direction brought by the I.S.U. of A., and Browne's efforts to create uniform standards for skating, the United States Figure Skating Association was formed in 1921 to govern the sport and promote its growth nationwide. Known today as U.S. Figure Skating, the organization is comprised of member clubs, individual members and associate members. When the association was formed and became a member of the International Skating Union (ISU), there were seven charter member clubs of U.S. Figure Skating. Currently, there are more than 750 member, collegiate and school-affiliated clubs and more than 1,000 Learn to Skate USA programs. Membership in U.S. Figure Skating carries certain privileges and entitles figure skaters to participate in tests, competitions and shows sponsored by the association. Until the early 1920s, there were no set standards for proficiency in the sport; if a skater felt qualified to compete, he or she did so. Today, skaters must pass a series of progressively more difficult tests. The highest test level in singles skating consists of the senior free skate and moves-in-the-field tests. In 1938, formal ice dancing tests were established and, in the late 1950s, pairs tests were established. Competitions on every level are a principal incentive for figure skaters to train, develop and improve their skills. By ascending the competitive ladder, competitors registered with U.S. Figure Skating gain entry into international figure skating events including the Olympic Winter Games and the World Figure Skating Championships. All major qualifying competitions such as the regionals and sectional championships and U.S. Championships are sanctioned by U.S. Figure Skating and conducted with the support of member clubs. Exhibitions and ice shows provide experience and exposure for many young, up-and-coming athletes. Member clubs are eligible to hold carnivals and shows with sanctions from the organization. Ice shows, as we know them today, actually originated from U.S. Figure Skating-sanctioned carnivals. In the 1920s and 30s there was no such thing as a commercial ice show. At that time, a few member clubs hosted annual amateur ice carnivals that showcased the top national and international skaters. Only later, after champions such as Sonja Henie of Norway had gained their reputations through these carnivals, did they turn professional and inaugurate the professional ice shows and exhibitions. An important function of U.S. Figure Skating has been the organization's development of the Memorial Fund. The fund was instituted following the 1961 plane crash that killed the entire U.S. World Team, as well as officials, coaches and friends. The Memorial Fund was created to give continuing support and assistance to young skaters. U.S. Figure Skating has published a monthly magazine, Skating, since the debut issue in December 1923. The magazine provides information on the world of skating for members and the sport's enthusiasts. In addition, U.S. Figure Skating launched its first website in 1996. Since then, www.usfigureskating.org has grown into one of the most comprehensive websites for figure skating in the world. In 2002, the ISU Council implemented the international judging system to replace the 6.0 system. It was first voted into use and is now used at all ISU- sanctioned events and U.S. Figure Skating qualifying events. The new system gains objectivity by utilizing computer technology and a technical panel in addition to the judging panel. In November 2006, U.S. Figure Skating launched icenetwork.com in partnership with MLB Advanced Media (MLBAM), the interactive media and Internet company of Major League Baseball. Icenetwork.com serves as a portal to enhance the figure skating fan experience. With extensive free content from around the world and access to subscription-based video through the icenetwork.com Season Pass, icenetwork.com covers every angle of the sport of figure skating. Figure skating has come a long way since the time Haines took to the ice, and its continued growth will be assured through the support and guidance of U.S. Figure Skating. source: United States Amateur Roller Skating Association (USARSA) site maintaining the history of the association that was in existence from 1939 to Fall 1971. This was posted in 2014. ​Since ice skating and roller skating had the same competitive disciplines, and many of the skaters performed both on blades and on wheels, governing bodies at first tried to cover both sports. The National Skating Association of Great Britain was founded in 1879 to govern ice skating and added roller skating during the 1880s. Similarly, the US. National Amateur Skating Association (USNASA) was established as an ice skating body in 1886, but took on roller skating shortly afterward. In 1891, the International Skating Union of America (ISUA) was founded to govern both ice and roller skating in the United States and Canada. However, the U.S. Figure Skating Association, founded in 1921, was concerned only with ice skating. When the ISUA folded in 1927, roller skating was left without a national governing body. The Amateur Athletic Union [AAU] which controlled most American amateur sports at the time, wasn’t happy with the RSROA, because its membership [also] included rink owners and professional skaters. As a result, the United States Amateur Roller Skating Association (USARSA) was founded in 1939 and immediately became affiliated with the AAU. The USARSA was a member of the U.S. Olympic Association, Amateur Athletic Union, Federation Inter-Nationale de Roller Skating [FIRS], and was affiliated with the U.S. Figure Skating Association [ice], the Amateur Skating Union of the U.S. International Olympic Committee, and the International Skating Union. The USARSA was made up of state and sectional associations, each with local skating clubs. The two rival groups held separate national championships until 1972, when the RSROA amateur skaters, the USARSA, and the U.S. Federation of Amateur Roller Skaters merged to form the U.S.A. Confederation of Roller Skating (USAC/RS), now known as USA Rollersports. Coincident with the existence of the USARSA was the RSROA (Roller Skating Rinks Operators Association). 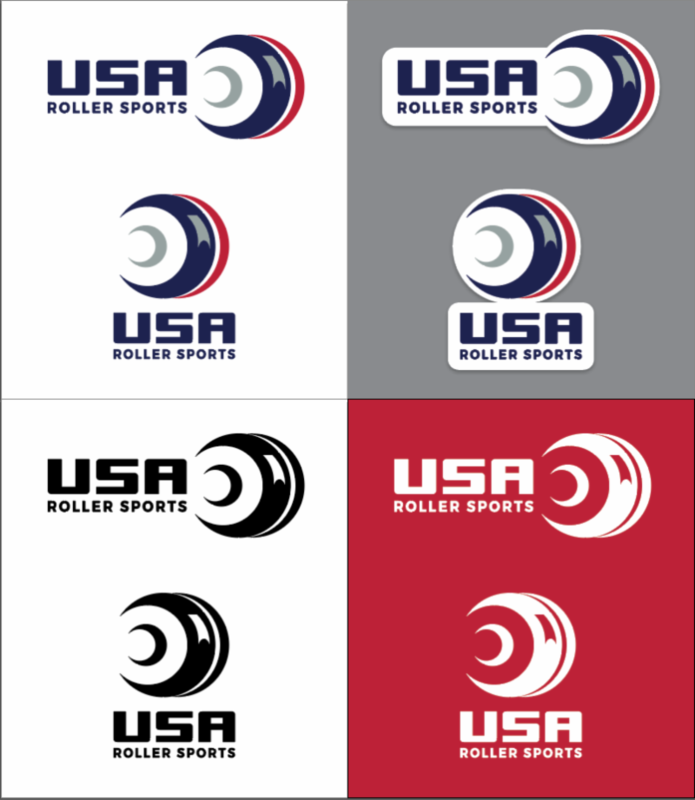 Around 1972, the two organizations merged under one name, the USARS (USA Roller Sports). A group of USARSA skaters opposed the merger and went to court over the issue. They broke away from the newly - combined organization and established themselves as the National Amateur Roller Skating Association (NARSA). This small organization still exists, but with fewer rinks they have struggled with fewer competitors over the years, yet were able to have their 33rd Annual Nationals at Kendall Park, N.J. in July 2005. Although the old USARSA and our state organization (NJARSA) have long since dissolved, those of us who were members back then will never forget the wonderful sport we engaged in and the great champions we produced. An update from Dawn Brown Kungl. On Saturday, June 27, 1964 a Testimonial Dinner Dance was held at the Hotel Essex House in Newark, N.J. for Jay Brown. He was honored for his outstanding work as President of the New Jersey State Amateur Roller Skating Association for many years. Gerry King produced a program for Jay "This Is Your Life". Mr. Brown also was the manager of Capitol Arena, Trenton and the 1St manager for Kendall Park Rink, N.J. As of this writing April 2nd, 2006 Jay is enjoying retirement in N.J.
By the early 17th century, ice skating had become such a convenient way for the Dutch to move around on their frozen canals that, in warmer weather, they evidently began using a primitive type of roller skate, made by attaching wooden spools to a platform. Some sources give the name of the inventor as Hans Brinker or Brinkner. The documentation for all that is very skimpy and questionable, though. We're on much firmer ground with John Joseph Merlin. A Belgian-born mechanic, Merlin settled in London in 1760, when he was 25 years old. He made fine clocks and watches and also came up with a number of inventions, including a "perpetual motion machine" that was powered by changes in atmospheric pressure. In 1760, he made made himself a pair of roller skates. According to a contemporary report, Merlin chose to demonstrate his invention at a costume ball in London. He rolled into the ballroom, playing a violin, and crashed into a very expensive mirror. The mirror was shattered and Merlin was badly injured. That ended experimentation with roller skates for about 30 years. Another Belgian, Maximiliaan Lodewijik Van Lede, in 1790 made a roller skate that he called the patin a terre, meaning "earth skate" or "land skate." While Merlin had used two iron wheels, Van Lede's skate was an iron plate to which wooden wheels were attached. Van Lede was living in Paris when he came up with his invention. The idea of the roller skate must have been in the air of France. The first roller skate patent was issued in 1819 to a Frenchman named Petitbled for a design that had two to four rollers of copper, ivory, or wood on a wooden soleplate to be attached to a boot. Four years later, Robert John Tyers of London, who was an avid ice-skater, was issued a patent for a skate he called the "Rolito." It had five wheels in a single row. The center wheels were slightly larger than those on the ends, allowing to skater to maneuver by shifting weight to the front or rear. Another roller skate patent was issued in Austria in 1828 to August Lohner, a Viennese clock maker. Up until then, all the designs had been for in-line skates, but Lohner's version was like a tricycle, with two wheels in back and one in front. He also added a ratchet to prevent the skate from rolling backward. Now back to France, where Jean Garcin also received a patent in 1828, for a skate that he called the "Cingar," reversing the syllables of his last name. This was another in-line design, with three wheels. Garcin opened a roller rink, gave lessons, encouraged ice skaters to take up roller skating in warm weather, and wrote a book, Le Vrai Patineur ("The True Skater"). But so many people were injured while skating in his rink that he was forced to shut it down. Every so often, roller skating got some publicity from the theater. In 1818, a ballet called Der Maler oder die Wintervergn Ugungen ("The Artist or Winter Pleasures") was staged in Berlin. Ice skating was among the winter pleasures portrayed, but it had to be simulated by roller skaters. It's not known what type of skates were used. Monsieur and Madame Dumas, who were professional dancers, led a performance of fancy roller skating at Paris's Port Saint Martin-Theatre in 1840. The German composer Giacomo Meyerbeer wrote an opera, Le Prophète, which included an ice skating ballet scene on a frozen lake. Again, roller skaters had to pretend to be ice skaters. A French skater, Louis Legrand, was hired to teach the dancers how to skate. Legrand also created two kinds of skates for the production. For the men, he designed boots with two wheels, front and back. For the women, he made skates with two wheels in front and two in back, the first appearance of what are now known as "quad" roller skates, to distinguish them from in-line skates. The Meyerbeer opera opened in Paris on April 6, 1849, and in London on August 24 of that year. It opened in New Orleans less than in a year after its Paris premiere, though the opera wasn't staged in New York until 1853. Le Prophète was very popular, as was an 1849 ballet, Plaisier de Hiver ou Les Patineurs ("The Pleasures of Winter or the Skaters)", another show in which roller skaters impersonated ice skaters. These two productions helped make roller skating a very popular pastime in both France and England during the 1850s. Large public rinks were opened in 1857 in London, at the Floral Hall of Covent Garden and The Strand. A new skate, known as the Woodward, was invented in London in 1859. The Woodward skate had wheels made of vulcanized rubber, which offered better traction than iron on wooden rink floors. There were four wheels, two of them paired in the middle and slightly larger than those on the ends to make it easier to turn. Turning and stopping had always been problems with roller skates, and the Woodward design didn't solve those problems any more than the similar Rolito. However, the Woodward skate was enough of an improvement to be adopted by Jackson Haines for his exhibitions. Haines, the founder of modern figure skating, was mainly an ice skater, but he had to use roller skates for his stage demonstrations of the art. He also appeared in a revival of Le Prophète in the late 1860s. The Cingar skate also had a brief revival, thanks to demonstrations at the 1867 Exposition Universelle in Paris. But the Cingar and all other roller skates were rendered obsolete by the modern "quad" roller skate, patented by James Leonard Plimpton, a furniture maker, in 1863. Instead of placing the wheels in-line, Plimpton put one pair in front and another in the rear. His biggest innovation, though, was to put the wheels on pivots so they could turn independently of the platform. He also added a rubber cushion that allowed the skater to lean in the direction of the turn. The original Plimpton skate had toe and heel clamps, but an improved design, introduced in 1866, used straps with buckles instead. Plimpton installed a skating floor at his furniture business in New York City, where he leased skates. He also founded the New York Roller Skating Association (NYRSA) to promote the pastime. 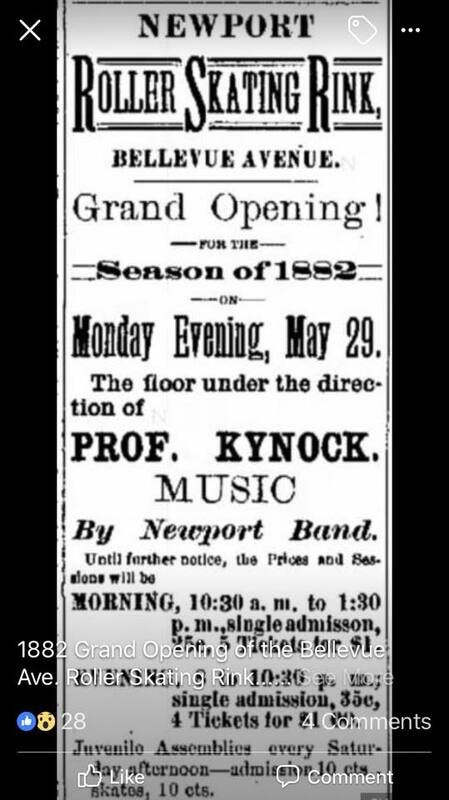 The NYRSA converted the ballroom of the Atlantic House, in Newport, Rhode Island, into a public skating rink in the summer of 1866. The Plimpton skate was such an improvement over previous designs that other manufacturers quickly began making copies. Plimpton's lawyers developed a form letter to send to those who were infringing on his patent. But Plimpton's efforts went well beyond merely making skates. He introduced a medal for those who could pass a skating proficiency test he developed, operated roller rinks in the Northeast, and traveled throughout the region, giving lessons. By 1870, the proficiency test medals were being given out in 20 countries where Plimpton skates were being used. Another American, William Fuller, also helped popularize roller skating in other parts of the world. In 1860, he drew crowds of appreciative Australians when he performed his comic skating act at the Royal Theatre of Melbourne. Five years later, he performed in Egypt, India, and Russia. In St. Petersburg, fans skated in the public gardens with Fuller after his performances. Large rinks were opened in Paris and Berlin in 1876, followed by one in Frankfort and another in Paris in 1877. As the popularity of roller skating grew, manufacturers developed methods of mass production, driving prices down, which in turn made the pastime more affordable and therefore more popular. The Samuel Winslow Skate Company of Worcester, Massachusetts, founded in 1837 to manufacture ice skates, began making roller skates for Plimpton about 1870. Then Winslow began making its own skates skates. Plimpton sued for patent infringement. After a settlement was reached, the company kept on manufacturing Winslow skates. In 1886, Winslow made 260,000 pairs of ice and roller skates. It's been estimated that there were then more than a million pairs of roller skates in use, many of them being rented out by more than 3,000 rinks. Henry Richardson Plimpton, the son of James, pioneered the use of ball and roller bearings in many applications, including horse-drawn carriages and roller skates. His design for a "silent wheel" skate incorporated three sets of ball bearings inside the wheel. A better system was patented in 1884 by Levant M. Richardson, who owned skating rinks in Illinois and Wisconsin. 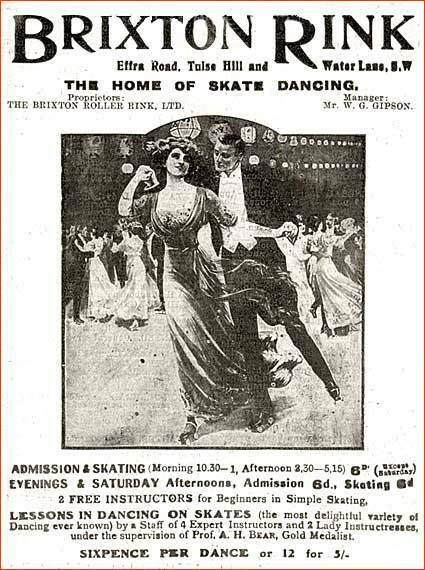 He and his wife often did exhibitions to demonstrate the skates and in 1898 he founded the Richardson Ball Bearing and Skate Company. The Richardson skate was especially popular among racers. The Chicago Roller Skate Company, founded by Walter Ware in 1905, became the world's leading skate manufacturer during the 20th century, supplanting Winslow. Ware's company didn't make any major innovations, but it produced well-made, reliable skates. The shoe skate, a skating boot with the skate permanently attached, was introduced about 1900. They were used almost exclusively by professional skaters, though. Most people rented their skates at a rink, and shoe skates were seen as unsanitary, so clamp-on skates remained the rule for recreational skaters. These skates were often adjustable to fit people who took different sizes. Most skate wheels were made of boxwood or maple during the 19th century. Early in the 20th century, manufacturers began to use steel wheels, primarily for outdoor skating, and wheels of aluminum alloy for speed skating. Fiber composition wheels were developed for rinks because they offered better traction on the wooden floors and were more durable. John L. Wintz, who owned a California company that made plastic cosmetic cases and cigarette lighters, created a Lucite skate wheel in 1935. Then he became intrigued with the problem of making a wheel that would combine traction and durability. He eventually came up with a wheel made of brake fiber with rubber inlays. To manufacture the wheels, Wintz formed the Sure-Grip Skate Company in 1936. Other companies, notably Raybestos, later began making similar wheels. During the 1960s, polyurethane became the material of choice for skate wheels. It still is. Because it's very hard without being susceptible to shattering, skate wheels are now made mostly of polyurethane. Fillers are often added both to cut costs and to soften the material so that it will offer better traction. Roller skating has gone through several boom-and-bust cycles. The first boom lasted from the 1870s into the early 1890s. The Grand Hall Olympia in London, the largest roller rink ever built, with a skating area of 68,000 square feet, opened in 1890 but closed within a year. (It did reopen from 1909 to 1912.) Other large arenas in Europe and North America were soon forced to shut down. The revival came quickly, starting in the United States right around the beginning of the 20th century. Emblematic of the sport's comeback was the 1902 opening of a public roller rink in Chicago that attracted 7,000 skaters. Representing the Winslow Roller Skate Company, Chester Park went to Liverpool, England, in 1907. He rented Tournament Hall, installed a floor of maple parquet, and opened it as an American style skating rink. Its success led to the development of similar rinks throughout England and then on the continent. This spell of "roller skating fever," as Park called it, ended when World War I began. When the war ended and the 1920s began, dance fever took over and many pre-war skating rinks became post-war dance halls. Not all of them, though; roller skating wasn't dead, simply not nearly as popular as it had been. Many roller skating clubs had been organized in England and Europe before the war and a lot of them resumed operating soon after war's end. Also, ice skating was attracting more followers and many ice skaters used roller skating as a means of practicing in the warmer months. In the United States, roller skaters began to move outdoors during the 1920s, as cities installed paved sidewalks and streets. In 1925, the New York City Recreation Department began holding annual speed roller skating tournaments, with preliminaries in playgrounds throughout the city leading up to the championship races in Central Park. Distances ranged from 100 to 880 yards and there were races for adults as well as youngsters. Each winner received a pair of skates as a prize. The rapid increase in paved roads to accommodate automobiles also made long-distance outdoor skating possible, with some limitations. When Mrs. Henry Pfetzing and her daughter, Anna, tried to skate the 400 miles from Kansas City, Missouri, to Peoria, Illinois, in 1927, they discovered that only 215 miles could be traversed on skates. For the rest of the distance, they had to trudge along dirt roads, carrying their skates. The same year, Arthur Allegretti was luckier. On a bet, he skated from Buffalo, New York, to New York City in 58 hours without sleep, fortifying himself with hot dogs and grape soda along the way. Professional speed skating became fairly popular as a spectator sport during the 1920s. Races were staged in major rinks and arenas. Madison Square Garden held a six-day race for three-man teams, patterned after its famous six-day bicycle races, in 1929. That was the extreme, but marathon racing for professionals and amateurs was also held at other rinks. Walter Miller set a record by skating for 147 hours, with some rest breaks, at the White City Rink in Boise, Idaho, in June of 1935. Interest in professional racing had pretty well died out by 1930 and amateur racing also began to decline during the 1930s and the Great Depression. During World War II, the manufacture of skates was put on hold, along with other industries not essential to the war effort. Roller skates made another comeback during the 1950s, thanks largely to the post-war baby boom. After another decline, the sport came back in the late 1970s, mainly because of the roller disco fad. Reportedly, the number of rinks in the United States increased from less than 1,000 in 1970 to somewhere between 3,000 and 4,000 in 1980. But the disco craze died quickly and about half the rinks were forced to shut down between 1980 and 1985. Shortly afterward, in-line skates arrived on the scene. For a time, it seemed as if the "new" type of skate might completely replace the traditional quad skate, but it didn't happen. In fact, the popularity of in-line skating may have helped to boost quad skating in the long run. While in-line skates are inherently faster, they're not nearly as maneuverable as quad skates. Some athletes, introduced to roller skating through in-line skates, became converts to quad skates because of the maneuverability. One factor was the rise of jam skating, a relic of the disco skating era. Jam skating combines dancing on skates with gymnastics and elements of figure skating. It requires quad skates, because they offer the balance necessary for many of the moves. According to USA Roller Sports, jam skating surpassed skateboarding in popularity early in 2005. There are 11.7 million jam skaters, compared to 11.1 skateboarders, the organization says. In-line skating is still more popular, though, with 19.2 million participants. Since roller skating was developed more or less as a warm-weather substitute for ice skating, its competitive forms are the same as for ice skating: hockey, speed skating, and artistic skating. The first to be developed was roller polo, a form of roller hockey that was being played as early as 1878 at the Denmark Roller Rink in London. The Amateur Hockey Association was founded in 1905 to govern the sport in England. It became the National Rink Hockey Association in 1913. Several different versions of hockey in roller skates developed in North America during the 1880s. A National Roller Polo League, founded in 1882, was based in Dayton, Ohio. Two years latter, the Massachusetts Roller Polo League was founded with 14 teams. Roller polo fell out of favor and was more or less replaced during the 1920s by street hockey, played on roller skates, in both North America and Europe. Women also began to play the sport as it moved back indoors and became known as rink hockey. U. S. teams generally used ice hockey sticks and a puck, while European teams used a ball and curved sticks similar to those used in field hockey. Because of the differences in equipment, the United States didn't take part when world championships were held in 1924 and 1936 under the auspices of the Federation International de Patinage a Roulettes (FIPR). The Roller Skating Rink Operators Association (RSROA) was founded in 1937 to govern all roller sports. In 1940, the RSROA drew up roller hockey rules for both ball and puck versions. But World War II intervened and the rules didn't go into effect until 1950. The first national championship tournament was held in 1961 and the United States finally entered a team in the world championships in 1966. Speed skating began about 1880. Rinks conducted professional races to attract spectators and amateur races to attract skaters. One of the outstanding racers in the early years was Fred Muree, a Native American who worked for the Argyle Rink of Boston. Over a two-year period, Muree won 284 consecutive 5-mile races. During the 1890s, he won more than $10,000 racing in Europe. The next great speed skater was Harley Davidson, who had nothing to do with the motorcycle company. Davidson came from a family that gave exhibitions of ice and roller skating. He became known for speed skating in ice in 1892 and switched to roller speed skating in 1905. He won the 1909 world professional championship at London's Olympia Rink, collecting a prize of $2,000 in gold. In 1911, he founded the Harley Davidson Professional Speed Skating Troupe, which traveled around the country, giving demonstrations and racing against local challengers. Although Davidson retired from speed skating in 1916, he continued to give exhibitions of artistic skating. During his racing career, Davidson won 3,035 races out of the more than 4,000 that he entered. His chief rival for many years was Rodney Peters of St. Louis. In 1908 and 1909, he toured the United States, taking on all challengers, and then went overseas, winning every race he entered in England and France in 1910. He was back in St. Louis on January 15, 1911, when a series of professional races began at the Jai Alai Rink. Davidson's troupe was there, too. Davidson felt that the judges were favoring the St. Louis skaters, led by Peters, so he pulled his troupe out of the races. The judging problems were symptomatic of the fact that there was no national governing body to standardize rules and oversee races. That was finally remedied in 1937, when Peters, who had become a rink manager, was one of the 17 founding members of the Roller Skating Rink Operators Association (RSROA). Another early speed skating great who was long involved in roller skating was Roland Cioni of Pennsylvania. He became a professional racer in 1910, when he was only 14, and joined Harley Davidson's troupe when it was organized the following year. Cioni won the World Professional Speed Skating Championship for the first time in 1914. He became the first to win it three years in a row in 1916, and went on to stretch the streak to eight in a row before his retirement at the end of 1921. Cioni began managing a rink in Chicago in 1916 and started to teach skating in 1919. Later, his wife also became an instructor. Between them, they trained a number of national artistic skating champions during the 1930s and 1940s. The "world championship" that Cioni won eight times was only for skaters on the North American professional circuit. It was always held in the United States, and almost all of the competitors were American. At that time, there were no true world championships in roller skating because there was no international governing body. Four countries, England, France,Germany, and Switzerland, formed the Federation International de Patinage a Roulettes (FIPR) in April of 1924. It was renamed the Federation lnternationale de Roller-Skating (FIRS) in 1925, when Belgium and Italy joined. At first, the organization governed only roller hockey. In1936, Germany asked the FIRS for permission to host the European roller hockey championships and, at the same time, requested that they be called world championships and that artistic skating and speed skating championships be included. The FIRS agreed. Held in Stuttgart, the combined championships were very successful, motivating Egypt, Ireland, and the Netherlands to join the federation the following year. At the time, most European countries had governing bodies, but the United States did not. It was long before there were two rival governing bodies. First came the Roller Skating Rink Operators Association (RSROA), founded in 1937. The RSROA first developed rules for amateur speed skating, then did the same for artistic skating in 1939. Also in 1939, the U. S. Amateur Roller Skating Association (USARSA) was founded by some skaters who didn't feel that their sport should be controlled by rink owners. The USARSA began with artistic skating, holding national championships in that discipline in 1939. Speed skating was added in 1942. Artistic roller skating was rather slow to develop as a competitive discipline. During the first boom, in the 1880s, rinks hired instructors to teach the rudiments of skating to beginners and fancier maneuvers to advanced skaters. Since most of the instructors (and quite a few of the students) were also ice skaters, they borrowed most of those maneuvers from figure skating on ice. Rinks often offered certificates and medals to skaters who could pass proficiency tests that usually included skating some figures. Many of them also staged competitions for their more advanced skaters. Of course, there was little or no standardization among such competitions, which were designed mainly to keep skaters coming to the rink. Figure skating on ice was still in its infancy and hadn't yet developed as a competitive sport. It appears that roller skaters had to wait for the ice skaters to get their act together. And that took a while. For about 20 years, figure skating was tangled in a controversy between purists, mostly from England, and adherents of "fancy skating" as pioneered by Jackson Haines. The purists advocated the sheer technique of tracing figures properly, as opposed to the flamboyant free skating that Haines had developed. In 1898, the world figure skating championships were held in England, and many English skaters decided that they liked the "International Style" after all. The result was a compromise: Figure skating competition combined compulsory figures with free skating. Artistic roller skating took the same course at first. However, figures and freestyle skating became separate competitive events in 1949. Technically, figure roller skating lagged well behind its counterpart on ice, mainly because the skates lacked an effective toe stop. The toe stop is the roller skate's equivalent of the toe pick on an ice skate: it allows the skater to take off on jumps. There were several attempts to design a toe stop, the first in 1876, but none of them worked very well. Eli Fackler, a part-time instructor who happened to be a full-time engineer, began working on the problem during the 1940s. He came up with a rubber stop on a set screw that made it adjustable in height. His design is still in general use. The third artistic skating event, skate dancing, also began on ice with Jackson Haines. In 1865, he demonstrated waltzing on ice skates in Vienna, where the idea caught on immediately. As soon as suitable skates were available, waltzing on roller skates also became popular. During the early 20th century, special types of dances were created just for skaters. A distinct American style of roller dancing began to develop just before World War II, mainly because of Perry Rawson, a retired stockbroker who was an avid skater. The first chairman of the RSROA's Dance Committee, Rawson brought the British and European dance champions, Jimmy and Joan Lidstone, to the United States for a tour. Rawson built a rink at his estate in Asbury Park, New Jersey, where he often hosted instructors and skaters for demonstrations and discussions. To advance his ideas, Rawson published a newsletter and a magazine and wrote several books. During the war, U. S. skate dancers were cut off from any European influence and the American dance style evolved. The Americans skated upright, with unusual speed. That style didn't impress European judges, though, so Americans didn't do well at the world championships. In 1970, the RSROA added an International Style ['World Class'] event to the national championships to determine which skate dancers would represent the United States in the world competition. The rival USARSA never embraced the American style, so its skate dancers generally did better at the worlds. Since ice skating and roller skating had the same competitive disciplines, and many of the skaters performed both on blades and on wheels, governing bodies at first tried to cover both sports. The National Skating Association of Great Britain was founded in 1879 to govern ice skating and added roller skating during the 1880s. Similarly, the U. S.. National Amateur Skating Association (USNASA) was established as an ice skating body in 1886, but took on roller skating shortly afterward. In 1891, the International Skating Union of America (ISUA) was founded to govern both ice and roller skating in the United States and Canada. However, the U. S. Figure Skating Association, founded in 1921, was concerned only with ice skating. When the ISUA folded in 1927, roller skating was left without a national governing body. The Arena Gardens Roller Skating Rink in Detroit held the first U. S. roller speed skating championships April 2-4, 1937. Seventeen rink owners who attended met afterward to found the Roller Skating Rink Operators Association (RSROA). The Amateur Athletic Union, which controlled most American amateur sports at the time, wasn’t happy with the RSROA, because its membership included rink owners and professional skaters. As a result, the the U. S. Amateur Roller Skating Association (USARSA) was founded in 1939 and immediately became affiliated with the AAU. The two rival groups held separate national championships until 1972, when the RSROA amateur skaters, the USARSA, and the U. S. Federation of Amateur Roller Skaters merged to form the U. S. A. Confederation of Roller Skating (USAC/RS), now known as USA Rollersports.